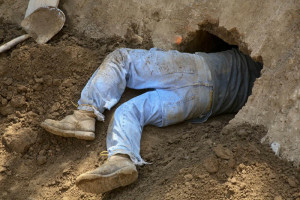 Omagh’s ‘Shawshank Husband’ Dug Tunnel From Bedroom To Pub Over 15 Years. An Omagh plumber tunnelled a hole from under his bed to the local pub 800 feet from his house over the course of 15 years, a court heard today. The tunnel was finally discovered after the DOE performed a survey on a sewage problem which turned out to be caused by a pipe Kerr had hit accidentally, causing sewage to leak into his tunnel over five years. The judge questioned Kerr’s wife as to why she never smelt the sewage odours from her husband. Mrs Kerr simply shrugged.